The leaf removal program takes place in the fall and is designed to supplement the homeowner’s leaf disposal responsibilities for unincorporated areas of Winfield Township. This program is not designed to remove 100% of your leaves. From the start date to the time the snow falls I s a very short window of time, therefore the Township guarantees just one pass through the Township. 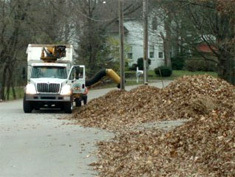 The Township removes leaves on 48 miles or 96 lane miles of road throughout the Township. WHEN: Leaf removal will begin November 11, 2019. Watch for start date information in the Fall Winfield Township Newsletter. Signs will be placed in your area approximately one week prior to your area’s pick-up date. Once the crews have gone down your street, do not place leaves out, because the crews will not be back. Other options for leaf removal are: mulching, hiring someone to rake and haul away the leaves or contacting your garbage hauler for their guidelines. 1.Leaves are not to be placed on pavement or road. 2.Place loose leaves, not mulched, in a long row, along frontage of property, parallel to edge of road, no further than five feet from pavement. 3.If on a street with drainage ditches, please rake leaves between the ditch and edge of the road. Storing leaves in the 4.ditch presents problems during rainstorms. 5.Do not include any other debris such as cans, paper, bottles, rocks, logs, brush, or construction materials. These objects can damage the equipment or cause injury to the crews. 6.Leaves that are in non-compliance and therefore not picked up, will then be the homeowner’s responsibility to remove. 7.Weather dictates as to how soon after the start date your leaves are collected.